Table toppers, a 100% win rate, records tumbling left right and centre – Manchester City are emerging as a Special Force this season after a fifth Premier League win was achieved without their own SAS strike corp.
Fight Till The End – City celebrate the last minute winner at Selhurst Park. Deprived of Silva, Aguero (for the most part) and Sterling, Manuel Pellegrini’s early pace setters still managed to clip the wings of Crystal Palace’s high flying Eagles – thanks to a fledgling out of Africa. Kelechi Inheanacho’s 90th minute winner, after just 55 seconds on the field and a Premier League career spanning all of four minutes, was difficult for ‘Potty Marf’ Alan Pardew to swallow – despite the Palace boss having one of the biggest and most obnoxious ‘gobs’ in football. 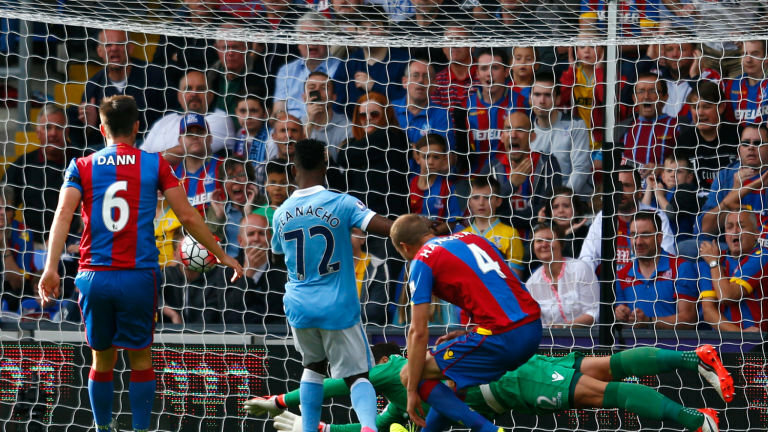 Tasty Nacho – Kelechi savours his last minute strike to down the Palace Eagles. 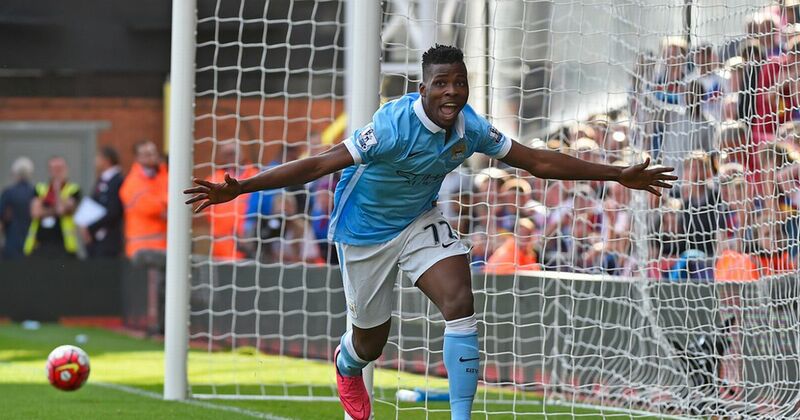 The 18-year old Nigerian ‘Eagle’ swooped to smash the ball home, after Palace keeper McCarthy could only parry a Samir Nasri shot into the flight path of City’s outstanding young talent. City’s iconic No 9 shirt is still up for grabs since Alvaro Negredo departed for Valencia, and if Kelechi continues his meteoric rise things will quickly add up in his favour. His 7+2 squad number could see him take the coveted No 9 in future years, as the City Football Academy begins to bear first team fruit. 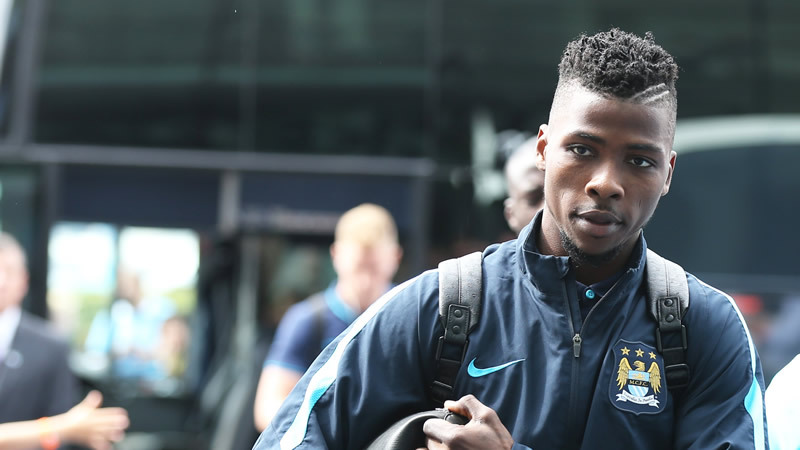 7+2 – Iheanacho scores the first of what promises to be many goals for City and could earn him the No 9 shirt. When City opened their superb £200m training complex last winter, the #CFA was all the rage on social media. Now, with City already 11 points clear of Jose Mourinho’s ailing champions, #CFA might easily be an acronym for #ChelseaFeckinAnnihilated. As if three defeats and 12 goals conceded in just five games isn’t sour enough for Mourinho to taste, imagine his heightened acidity levels when he saw Kevin De Bruyne collect a Man-of-the-Match award, after his 25th minute introduction for a stricken Aguero. Mutual appreciation – Record signing Kevin De Bruyne applauds the travelling supporters after a great start to his City career. Sergio was scythed down in an assault (let’s not dignify it by calling it a tackle) by Scott Dann – who amazingly escaped with just a yellow card from inept ref Mike Jones. Dann’s cynical and calculated kick out at Sergio’s knee means the Argentine talisman will be missing when City’s Champions League campaign kicks off against Juventus. 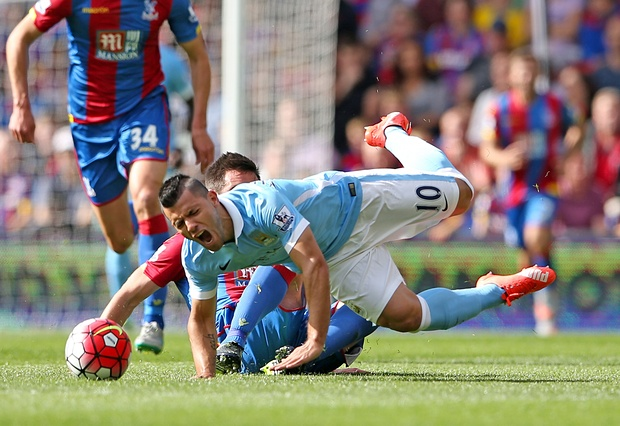 ABH, GBH, Common Assault – whatever it was, Dann’s ‘tackle’ on Aguero was downright criminal. The last time Aguero suffered a nasty knee injury was immediately prior to a crunch Champions League tie against Italian opponents. City famously won 2-0 in Rome – one can only hope it’s a warped omen. On the topic of ‘twisted’ we had the sight of loutish Pardew pushing past Pellegrini remonstrating with ref, Mike Jones and calling for Yaya Toure to be sent off for a 25th minute foul. 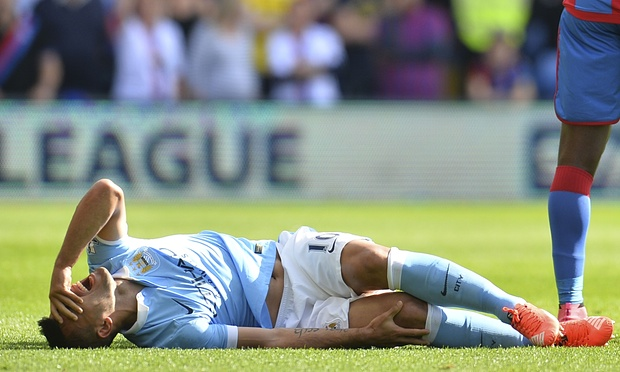 Aguero agony – Sergio misses the Champions League clash with Juventus after Scott Dann’s cowardly challenge. A clearly incensed Pellegrini had somehow managed to maintain a degree of Chilean cool seven minutes earlier, when Dann re-enacted the Battle of Wounded Knee on Aguero, but this was too much. Having charged into Pellegrini’s ‘technical area’, the cockney barrow boy made bad, was repelled by the fired up City boss – once a decent amateur boxer back in his native Santiago. Peace? 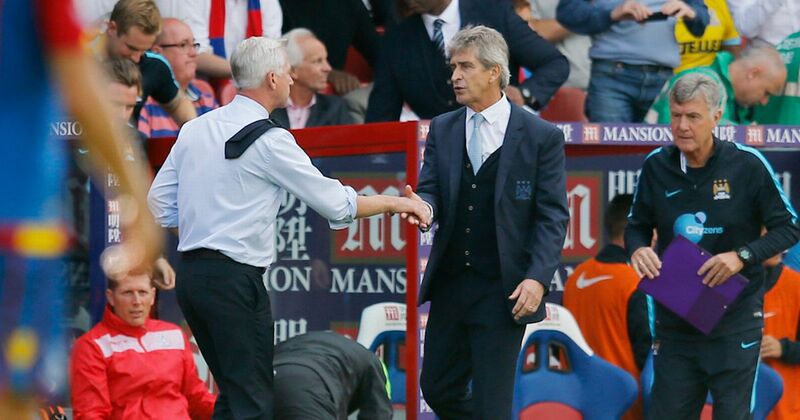 More like ‘P*ss Off’ – Manuel clearly dislikes Potty Mouth Pardew, but appears to accept a handshake of apology. Fair to say the clever money would have been on the South American to ‘drop’ Pardew – in the same way Iheanacho had delivered the glorious knockout blow of the match. This from the man whose Newcastle United team took Samir Nasri out with a horror tackle in January 2014, leaving him sidelined for nearly two months…with a knee injury! 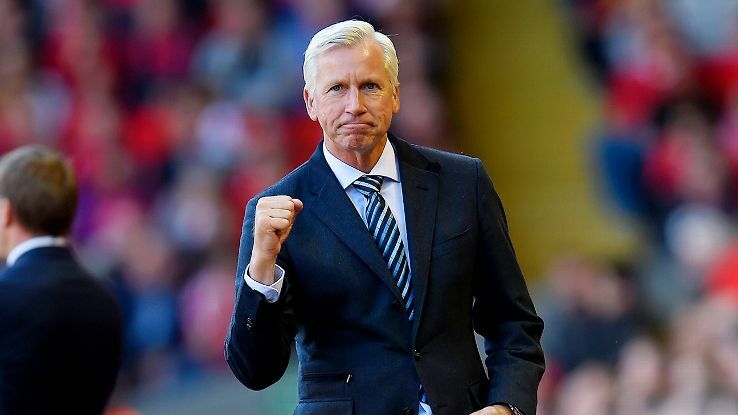 Hand of Gob – Pardew wouldn’t have lasted the first round with ex-boxer Pellegrini. 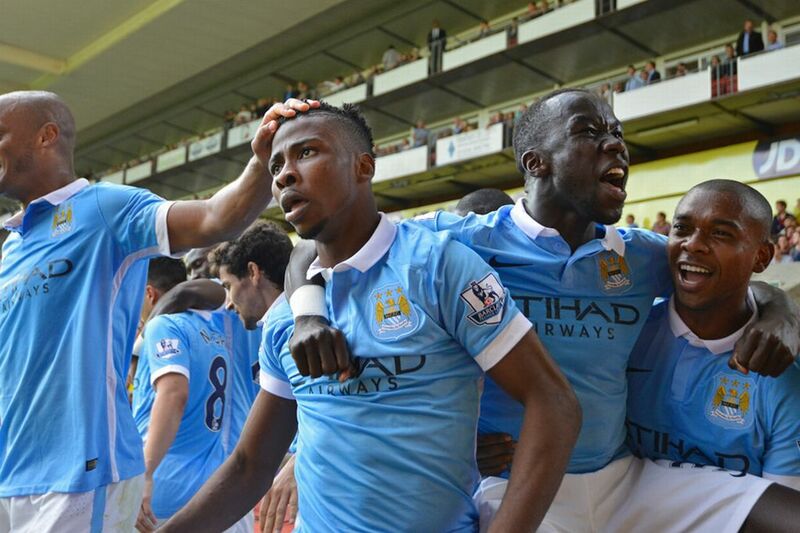 City fans are loving Pellegrini’s renaissance after the disappointments of last season. He has re-asserted his tactical acumen in a side that is now rife with pace, passion and purpose. Painful memories of the listless 2-1 defeat at Selhurst Park last April were obliterated as City showed they are infinitely stronger this time around. The new look squad has strength in depth, as well as the physical muscle and mental fortitude to come through these bruising and robust affairs. A sixth consecutive Premier League clean sheet was a new club record and City’s 11th PL win has them edging closer to Arsenal’s all-time 14/14 record set in 2002/2003. A defence thus far denied the presence of the legendary Pablo Zabaleta, and still awaiting the debut of the excellent Nicolas Otamendi, has gone 566 PL minutes since last conceding at Swansea. Record signing KDB was thrust unexpectedly into his debut as Aguero hobbled off to the unsavoury jeers of the Palace Neanderthals. 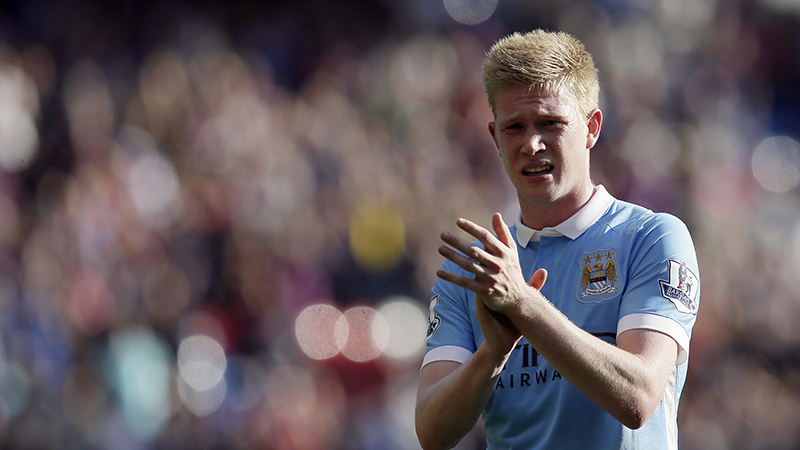 Impressive – KDB looked good, creating five chances for City on his impromptu debut. In just over an hour’s play the Belgian playmaker showed early signs as to why City pursued him with such tenacity throughout the summer. He tested McCarthy with a rasping long range drive and created five openings, the best of which the hardworking Jesus Navas failed to convert, when clean through on goal. With 99pts still up for grabs nobody at the Etihad will be counting any chickens, but City’s imperious start is already looking ominous for their rivals. 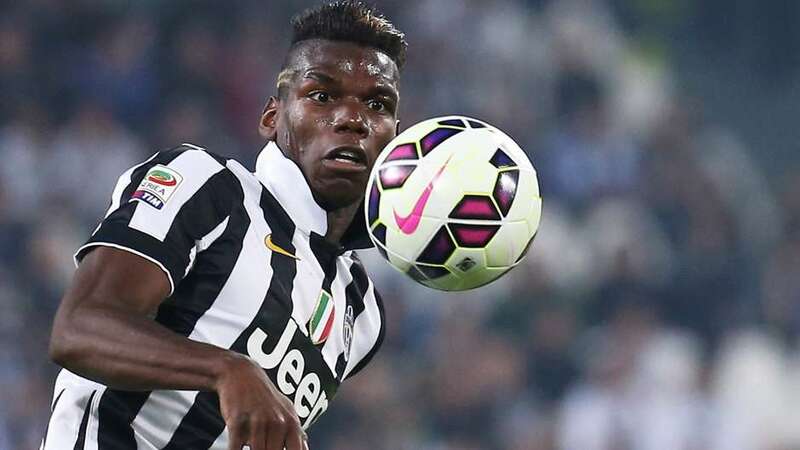 Pogba to City – but only as an opponent. The French midfielder is the ‘one that got away in an otherwise excellent summer transfer window. Next up is a much sterner test as the Old Lady of Italian Football rolls into Manchester. Juventus have been almost Chelsea-like in their defence of the Serie A title, with two losses and a fortuitous 1-1 draw in their opening three games. Last season’s Champions League runners-up are a much changed side after the departures of Andre Pirlo, Arturo Vidal and Carlos Tevez. The Group D opening game, gives City the chance to get close up and personal with Paul Pogba – the ‘one that got away’ in an otherwise highly successful summer transfer window. Juve keeper and captain, Gianluigi Buffon – so often quick to denigrate City in the recent past – is now on record saying City are one of the potential winners of this season’s competition. 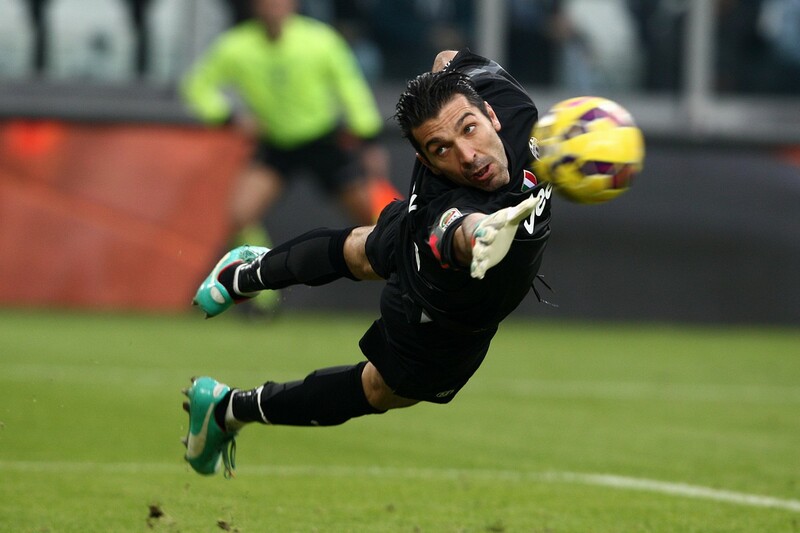 Change of tune – Juventus skipper Buffon is suddenly being polite about City after years of decrying the Etihad outfit. Even without Super Sergio, City are probably better placed than ever before to do just that. Dedicated to John Bookbinder – an outstanding left winger and member of City’s 1986 FA Youth Cup winning squad on what would have been his 47th birthday. Tragically John passed away in 2006 aged just 37. Gone but always remembered. RIP JB. Great selection of pics, good report as usual. Really pleased you Mentioned John Bookbinder. Could have left that ugly C..T Pardew off though, sour faced poor looser, I agree he must tell his players to kick us off the park. Great post as usual dave. It's looking good mate it's been a while since I've seen this team so fired up. 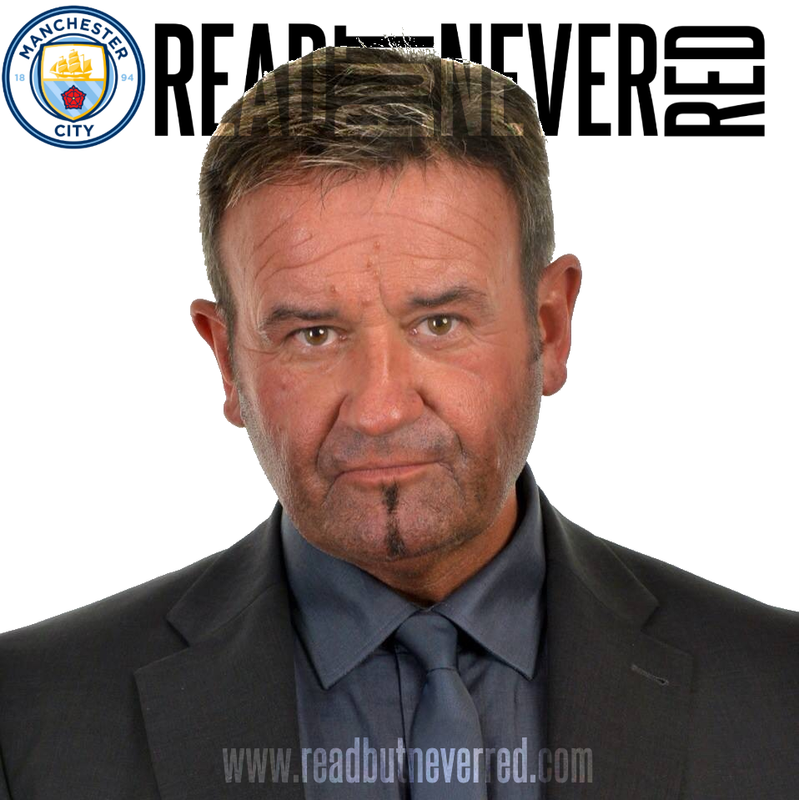 I give credit to every member of our squad especially Pellers I have no idea how this quite charming man did it , but he finally has this team playing the best football in the league. One niggle is the attitude of some fans. So much negativity when a player like kun is out. It's like the end of the world for some? ?..I don't get it, did they not watch the last 5 games?..the mind boggles. That aside thanks again for another well put well thought out post. Obviously the loss of Sergio is a blow, especially in the Champions League, but when he was injured last season I think we won seven and drew one in PL, CL and FA Cup. Thanks for your comment. Yes, I'd forgotten that one. Pardew is a wretched little man. MP is just superb this season. If we carry on in this fashion I don't give a flying wotsit about Pep Guardiola's availability. #TrustOurMP. Cheers Pete. I haven't seen any replays of the incidents but how that scythe on Sergio wasn't a red card is unbelievable. The rash tackle by Ya Ya was I thought at the time a possible red card but two wrongs Mr Jones, don't make a right. Thought KdB was very good coming on earlier than perhaps MP wanted - he has vision, pace and a rasping shot. Not the best of starts in the old Champions League - we've never won an opening game, so why start now? However, all is far from lost but we can't afford any more slip ups in Germany at the end of the month. Why oh why do we always manage to make life so difficult for ourselves? 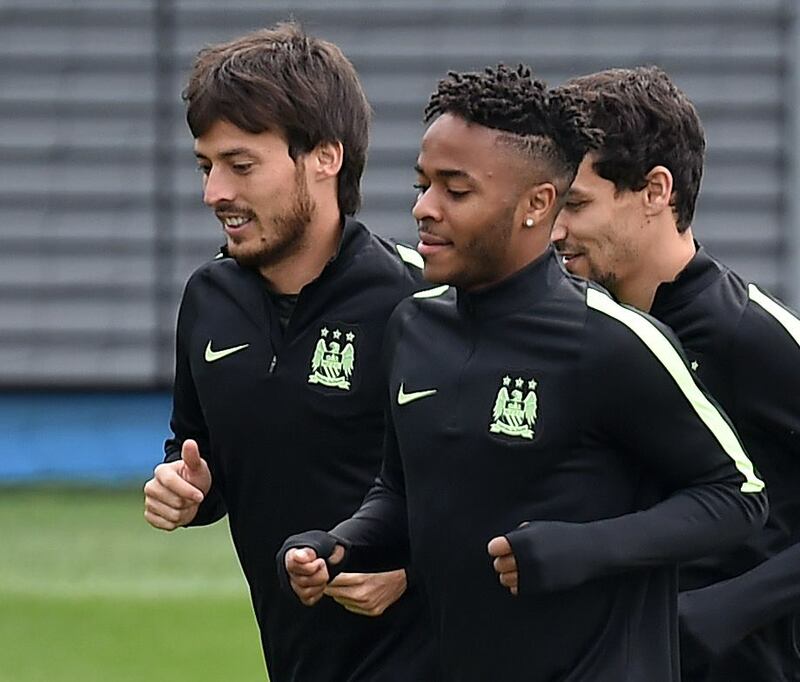 One wonders if Silva and Sterling were fully match fit and of course Sergio was missing. That said this is our fifth season in CL - we can't keep making excuses. The apprenticeship has been served and it's high time we stepped up. Thanks again RC. Thoroughly enjoyable read David. Not a fan of the word Gob, but in this instance spot on. Pardew is an unpleasant man to say the least, the 4th ref should have dealt with him sooner. When he was at Newcastle they put Nasri out....... Seems to be his style. Loving the way our Blue Boys are playing this season, long may it continue. Thank you kind lady - it's been a while since I caught up with Mrs Ickle and BIG Dave. We may not have 'blown the bloody doors off' in our Italian job last night, but we Fight Till The End and MCFC fans know all about the 'Self Preservation Society'. Hi Dave, yet another great CITY read with your usual quality selection of photo shots of our beloved Blues! Yes, Pellers has us playing as a great team should and consequently, though Sergio could never be replaced, his absence tonight will be appropriately compensated by Merlin being able to exploit the space and pace of Raheem and Kevin. Come on you Blues...can't wait!! See you Saturday Dave...though you wouldn't want to upset me with telling me the scores! 128 Well...would you trust your MP?